162 pages | 6 B/W Illus. The spotlight of global scrutiny has shone particularly brightly on corporations’ adverse impacts on human rights in recent years. Corporations make up more than two-thirds of the world’s top economies today, and so rightly they are being called to account for their impacts on society and the communities in which they operate. The Business of Human Rights demystifies the relevance of human rights for business, explaining how the corporate responsibility to respect human rights under the UN Guiding Principles can be implemented in practice. It provides a straightforward, practical guide that can be easily read and interpreted by managers to help businesses navigate this complex area of legislation and "soft" law to fulfil their responsibilities. It explains the potential legal, financial and reputational implications for corporations and the steps they need to take to address them. The book tracks some of the major global developments in business and human rights, including the emergence of foreign, transnational, and international law and the proliferation of multi-stakeholder initiatives on business and human rights. Case studies from a range of sectors and industries – such as extractives, apparel, fast-moving consumer goods, electronics, and banking and finance – illustrate the enormous risks and opportunities human rights pose for business in practice. The Business of Human Rights will equip corporate executives, sustainability practitioners, academics, students, and anyone interested in business’s impacts on society with the essential information and tools they need to quickly come up to speed with the rapidly evolving area of business and human rights. "In a world in which ESG is firmly part of the landscape, successful risk management depends on shared prosperity between companies and communities if value is to be protected. Fundamental to this is an understanding of the business value of human rights. Alex Newton’s ‘The Business of Human Rights’ is a ‘must read’ for all business leaders who want to understand the environment in which business will increasingly be conducted." "The Business of Human Rights provides both a powerful argument for why businesses should take on the protection of human rights and a thoroughly practical guide book to how they can do so. It should be on the required reading list of every human rights activist and every corporate executive." "The old business mantra that human rights are matters for politicians is even less valid in today’s world of full transparency and media- and social media-intrusive scrutiny than it ever was. Corporate reputations can stand or fall on their treatment of human rights – see the hugely costly damage to the bottom lines of those global corporates complicit in ex-South African President Zuma’s corruption. 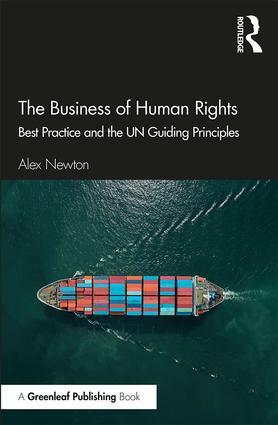 I strongly recommend Alex Newton’s The Business of Human Rights as a straight-forward and engaging guide for business executives, public officials and students." Alex Newton is a lawyer and specialist in responsible business and human rights. Her consultancy advises corporations, governments, and non-governmental organisations on a wide range of matters related to business and human rights, anti-discrimination, reputation risk, and governance. She regularly writes and speaks on these topics in Australia and internationally.